We have a birthday in the house this week! Our roommate is turning a whole year older and he loves coconut. I stumbled upon this recipe looking for a good coconut cake recipe. In my book, cake to cupcake is an automatic upgrade. Plus, these photograph a bit nicer than a plain white cake. These chocolate cupcakes are so easy to make. They’re my favorite kind – variations from a box. The addition of buttermilk and sour cream make them extra moist and fluffy. They’re a breeze to put together! The frosting is amazing. 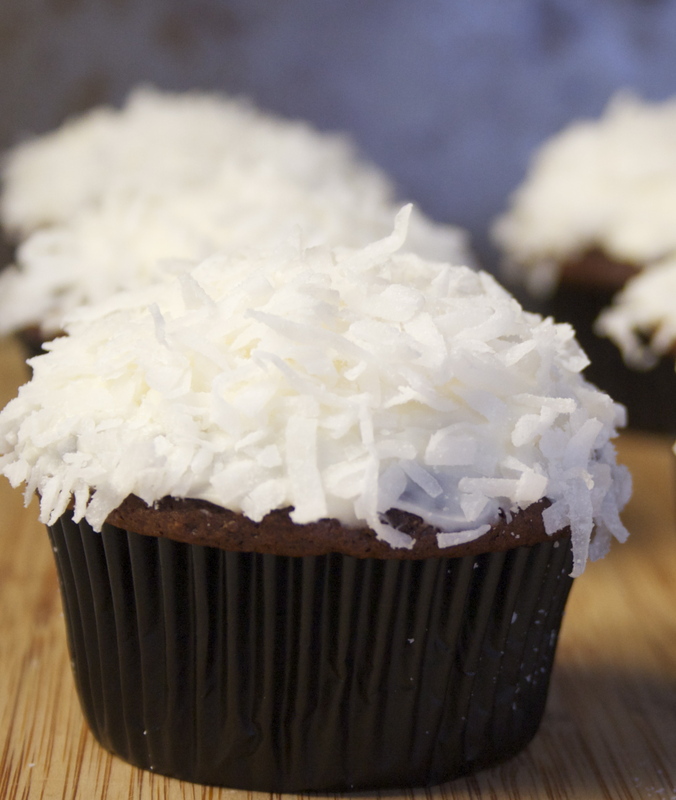 Coconut extract makes these cream cheese frosting perfectly tropical and the perfect counterpart to the chocolate cuties. 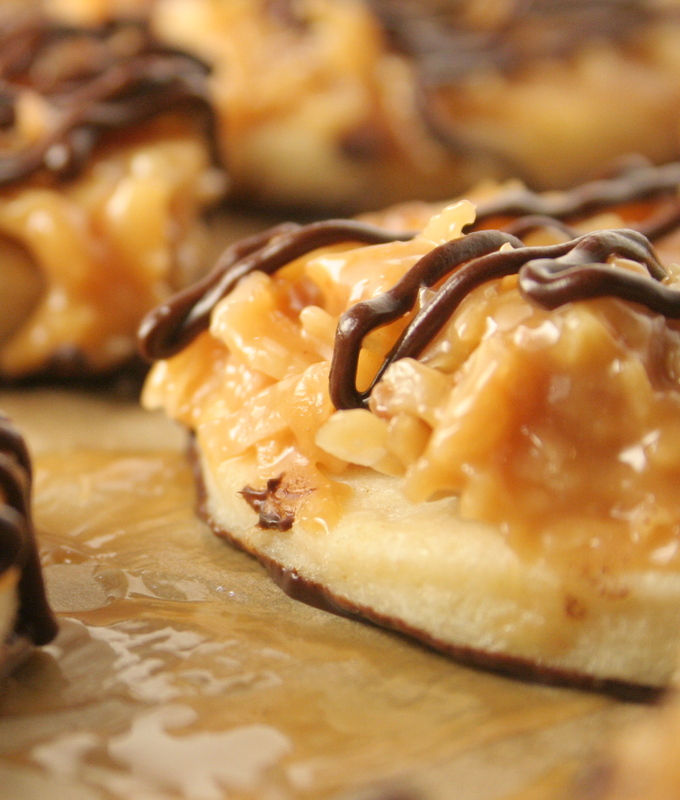 Dip them in a ton of sweetened coconut and you’ve got yourself a treat! Preheat your oven to 350 F. In a large mixing bowl, combine your egg, milk, sour cream and extract and whisk until well mixed. Add in your devil’s food mix and combine until all incorporated. Line your cupcake liners with your liner of choice and fill 1/2 way (a light handed 1/4 cup measurer). Careful not to overfill otherwise you’ll get cupcake edges that overhang the tin! Bake for 18-20 minutes until the top springs back at you, or a toothpick comes out clean. Let cool while you prepare the frosting. Using a hand mixer, cream together cream cheese and butter until light and fluffy. Add in your vanilla and coconut extract (mmm so delicious). Cream in your powdered sugar one cup at a time until well incorporated and you have a fluffy white coconut frosting to lick and eat. Save some for frosting! 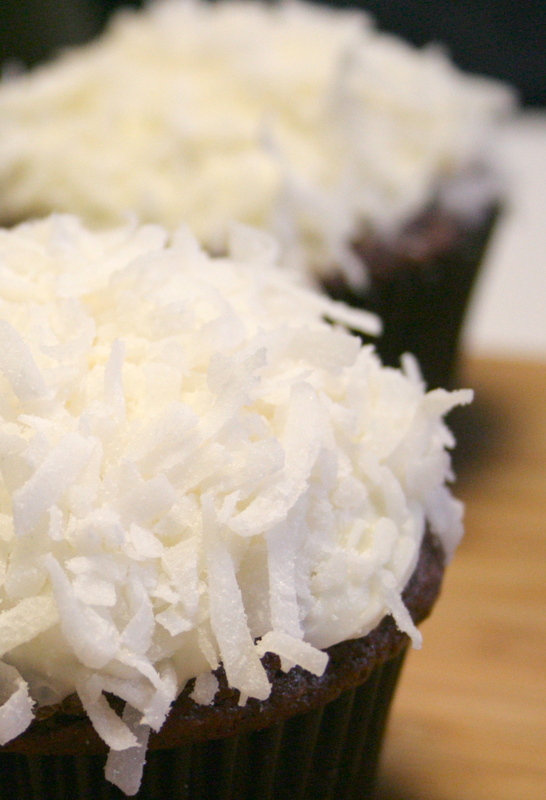 Frost each cupcake with a hearty amount of frosting and dip into your coconut flakes. You can pat on extra flakes for good measure and extra fluffy cupcakes. Plus! My husband had recently purchased a SAD lamp. You know – for people that get sad in the dark, long, cold winter? Great for feeling better. Also great for emulating sunlight! At all times of the day! That coupled with a real camera = I am no longer limited by time of day for taking photos! Also means that I have improved on my camera skills!!! Ahhhh!!! I was SO excited to see these!!! I mean, LOOK! Compared to the bare roots of the beginnings of this blog! Okay, enough about the photos. How about the cookies? These are, I daresay, better than the original. 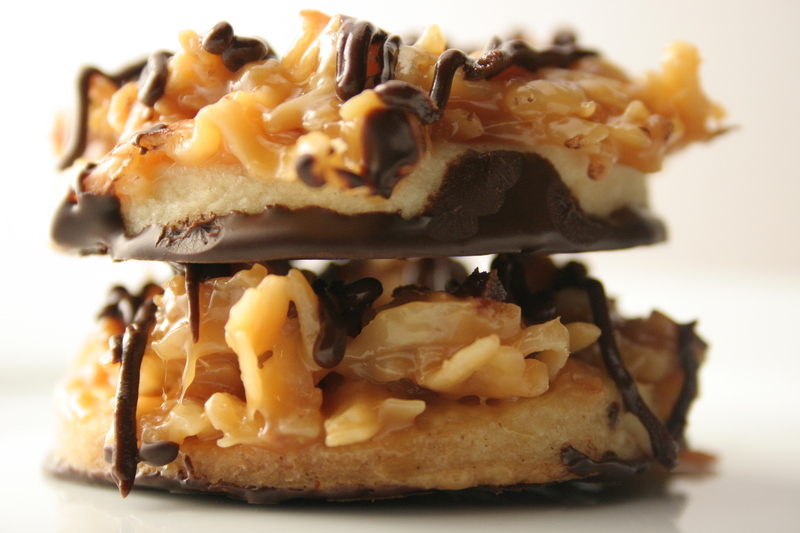 Made with freshly toasted coconut slathered in caramel atop a buttery shortbread cookie, the textures of this cookie are amazing, Where there times when I said “this is too much work!” when my fingers were covered in sticky caramel? Yes. Was it worth it? Abso-freaking-loutely. In a large bowl, cream together your butter and sugar until light and fluffy. Add in your flour, baking powder, and salt. You can mix your dry ingredients in another bowl or just do what I do. Sprinkle your baking powder and salt over your added flour to help evenly distribute!. Add in your whole milk and vanilla and mix until a dough forms. Wrap in saran wrap and refrigerate until cool for 1-2 hours. Let your dough warm up just a bit for 10-20 minutes right before rolling out. Preheat your oven to 350 F. Line some baking sheets with parchment paper or silicone baking mats. Take 1/3 of your dough and roll out to a sheet of 1/8 inch thickness. Cut the dough with a donut cookie cutter. Make sure to dust your surface with some flour to allow for easy release from your cutter. The shortbread dough does not spread during baking so you can squeeze a lot of cookies on one sheet! Bake for 10-12 minutes or until the sides are just barely golden. Err on the side of under baking these guys to keep them perfect! Remove and let cool. 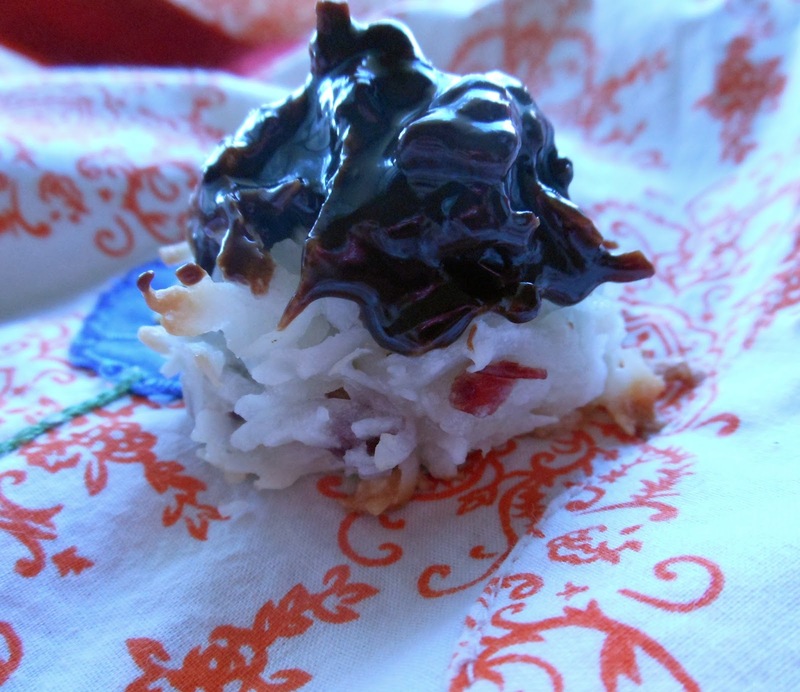 Spread your coconut out on a baking sheet. Bake for 10 minutes in a 350 degree oven. Toss the coconut every 2-3 minutes to ensure an even toasting. Careful, these delicious flakes can burn easily but freshly toasted coconut is so worth it! 1. Press your coconut mixture on your cookies while they are laying on a flat surface. Fingers worked best! Shortbread can be fragile. (I broke two – sad face). 3. If you think it would be easier to just buy some cookies, you’re right. But these are so much more delicious! Just remember that when caramel is everywhere. Melt your chocolate chips in a shallow bowl in 1 minute intervals in the microwave until completely melted. Mix in your butter. Dip the bottoms of your cookies in the chocolate for the chocolate bottoms. I used a pastry brush to ensure a nice even layer and it worked great! 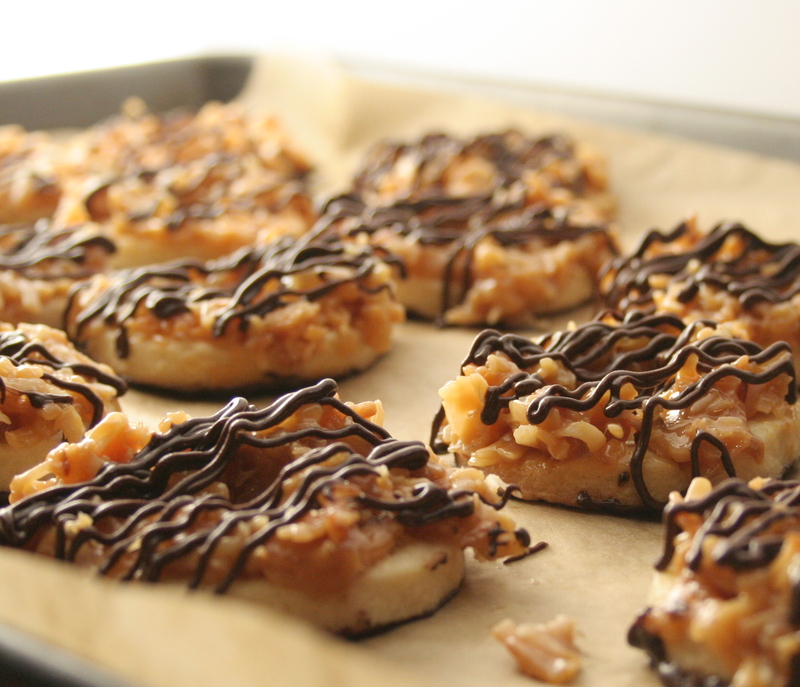 Put your remaining chocolate into the corner of a ziploc bag and pipe a chocolate drizzle over your cookies for that perfect samoa cookie effect. I’ve made these twice the last few weeks…the first time was a request, and the second time because they were so yummy. Ever since college, macaroons have been a go-to recipe of mine when there’s not much in the kitchen but I still wanted to bake. 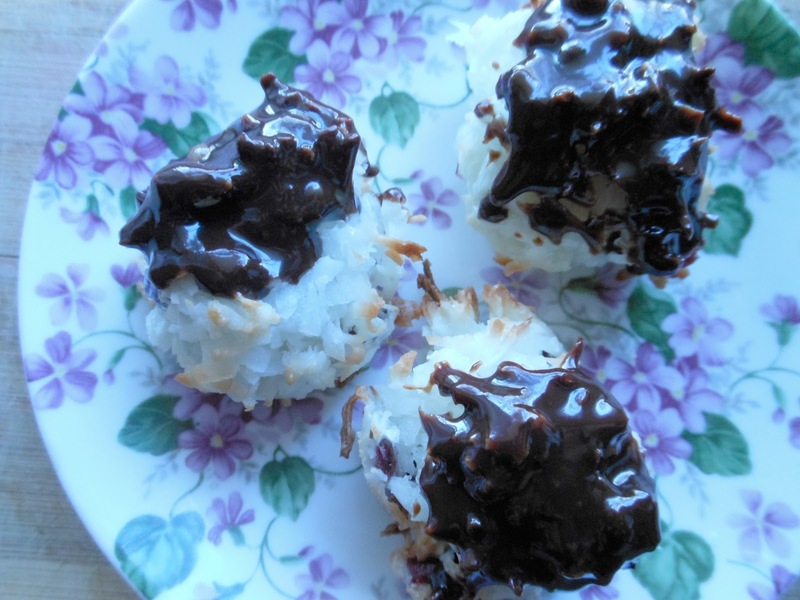 It’s a simple recipe with not too many ingredients and I could always whip it together as long as I had a bag of coconut flakes handy (which I tried to keep stocked). The first time I made macaroons at home, I was astounded by how much more absolutely delicious they tasted compared to store bought. When they’re made at home, they’re absolutely perfectly crispy on the outside and soft on the inside. I often ate one coming out of the oven and had it warm. 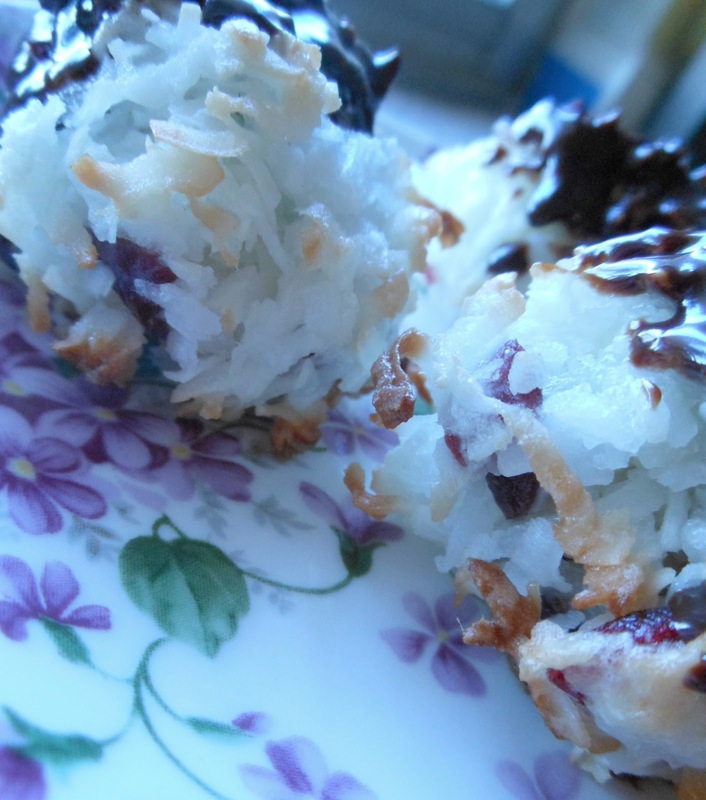 If you’ve never had a warm homemade macaroon, make it a priority. These were requested to emulate a similar creation at Au Bon Pain (or so I’ve been told). So I took my handy dandy macaroon recipe that I’ve used from the back of some bag years ago and adapted a bit for this concoction. They’re filled with cranberries and topped with chocolate ganache. Don’t forget that they’re still great warm, crispy, and most importantly homemade with love. Adapted from: I really am not sure. Preheat your oven to 325. Combine all of your ingredients for the macaroons into one big old bowl and mix well. I find that clean hands work very well! Line your baking sheet with parchment paper as they can get sticky. Ball out 1 heaping tablespoon amounts of macaroon sticky flakes and place about 3/4 inch apart – they don’t spread much. They should look like little macaroons on the baking sheet. I usually just lightly press my balls of dough onto the pan to give it a nice flat bottom. Bake for about 20-25 minutes or until the sides are golden brown. Set aside to cool. Break your chocolate bar into small squares and place into a heat-proof bowl. Heat your heavy cream over medium high heat until just bubbling on the sides – don’t let it boil! Pour your heavy cream over your chocolate squares and gently stir for a few minutes until the heat distributes and you have a shiny, delicious chocolate ganache glaze. Dip your cooled macaroon tops into the glaze and let set at room temperature or in the refrigerator. Enjoy! The mix of cranberry and chocolate is fabulous!